Columban missionary Fr Shay Cullen has urged people to lobby Filipino politicians against lowering the age of criminal liability in the Southeast Asian country. Report courtesy: The Catholic Universe. On Monday 4 February the Philippine Senate may decide whether to change the law and lower the age of criminal liability from 15 years of age to 12 years of age. “If they do (lower the age of criminal liability), that will make 12-year old children liable as criminals if they steal a banana in the market and they may have to stand trial. Then they may be sent to a children’s detention centre. These places are no better than prisons where it is life behind bars,” Fr Cullen, a four-time Nobel Peace Prize nominee, told The Catholic Universe. 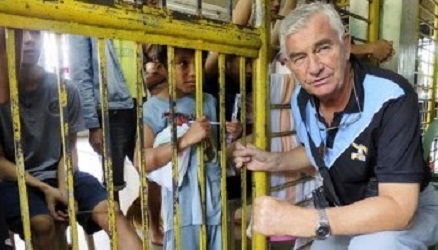 The Irish Columban priest, who is also the founder and president of the Preda Foundation (People’s Recovery, Empowerment and Development Assistance), which has helped vulnerable children in the Philippines for more than 40 years, warned that if these 12-year-old children are sent to a children’s detention centre, “they will be bullied, beaten and made slaves by the older, 17-year olds inmates and made to do sexual acts with the older boys”. The Preda Foundation has written an open letter, co-signed by Fr Cullen and Francis B. Bermido Jr, executive director of the foundation, to the senators informing them of their concerns regarding the vote and urging them to vote against lowering the age of criminal liability. (See full letter below). “We are appealing to the senators not to lower the age of criminal liability for these children,” he said. Fr Cullen revealed that the swing votes lie with a handful of senators and has urged Catholics to “help save the children” by getting in touch with them via email. “We appeal to you to act and help save the children: send a short message to the senators not to change the existing law, not to lower the age that would make children criminals at 12 years of age,” he said. The nation, child rights advocates and the parents of hundreds of millions of young children will remember you and your vote as the ones who turned the Senate in favor of children and did not act against their best interest. History will remember your vote as the vote that saved these children from jails. More than 300 civil society organisations have signed and published an open letter appealing to you not to lower the age. Majority of Filipinos said they are against lowering the age. The international community is against it. They are just children and have no knowledge or culpability of what they will do. This is due to their lack of education and being exposed to the bad example of adults and influence by a corrupt society. You as honorable senators are called to protect children from harm and not to expose them to harm. Please do not vote to lower the age. Do not condemn the children to jails. There are almost no decent government homes or Bahay Pag-asa for children in conflict with the law. The children are placed behind bars in cages without help or hope or education or proper food. This incarceration is illegal under all Philippine child protection laws and international law. But it happens now and everyday hundreds of children as young as ten years of age are jailed. They languish in subhuman conditions, become sick and are abandoned behind bars for no crime. They are sexually abused by older youth in small, overcrowded cells. This is happening now, today. This is a serious violation of the human rights and dignity of children. We rescue as many as we can and they tell us of the abuse they suffer. Please allow them to testify, view the photos attached. On behalf of hundreds of civil society organisations and the majority of the Filipino people who said in a survey they do not approve the lowering of the age whereby their children can be put on trial and jailed, please vote No.